Most pin tumbler locks are vulnerable to lock bumping. Bumping a lock is a way of opening a pin tumbler style of a lock by inserting what is called a bump key and then “bumping” or slightly jarring it to open. 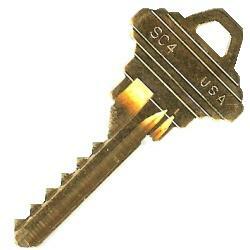 The bump key is sometimes also called a rapping or a 999 key. The bump lock key must line up with the lock to open it along the side grooves. The key is inserted and then pulled back out slightly to line up the pins. A slight whack on the back of the key caused the pins to jump above the shear line and, for a split second, the drive pins separate so that the plug is able to be rotated. A bump key aligns in a key way naturally and can naturally include methods to bypass auxiliary locking mechanisms. Keys are relatively inexpensive to obtain and modify. Bump keys are not universal due to key way restrictions. Lock bumping is so easy that a child can do it. A blank key with spaces cut to the lowest possible cuts is the first step in creating a pull-out key to be used for bumping a lock. The bump key is inserted into the lock and then moved one pin position before being bumped. All that is needed to create the impact of the bump is slight tension from your hand and then a strike, straight on, from a bump hammer. If everything works as intended, the driver pins will jump, and the plug will turn provided they are all above the shear line. It’s a sometimes delicate procedure that often times takes more than one attempt. Most locks that are available in a hardware store are able to be bumped, so it is beneficial to look at more solid locks. 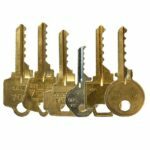 However, before you think spending a lot of money on a lock is the answer, understand that even expensive locks can have cheap cylinders that are able to be bumped. To make locks even more vulnerable, bump keys are sold on the internet and are easily accessible to would-be criminals. Burglars who use bump keys to enter know that the forensics will show no visible signs of forced entry unless the lock is thoroughly examined. Sidebars or sliders are a good line of defense against bumping. Some key manufacturers, such as Schlage, make bump-proof locks and keys. These keys have an extra tumbler that is unable to be bumped. Some brands add multiple pins and a sidebar that is not able to be bumped. Medeco makes a Bi-Axle key teeth are angled. Tumblers fit the notches and twist. Mul-T-Lock brand is known for its security features and its strength. Another option is to go key-less with programmable, combination locks that cannot be bumped. For deadbolts, there is an anti-bumping device that is designed to prevent thumb turn parts of the deadbolt from turning, which means the key cannot retract back inside the lock to open it. Have a professional locksmith install special pins, known as security pins, to make the lock more difficult to bump. These pins are designed to bind before they reach the lock’s sheer line. Non-pin mechanisms, such as a disc-detainer, combination, wafer, warder, or lever based lock, cannot be bumped. To prevent a bump key from making contact with all pin stacks, a random pin chamber is drilled higher than the others. One downside to this method is if you ever need your lock re-keyed, shadow drilling sometimes presents issues unless the position and height of the shadowed chamber are identifiable by the locksmith. Top Gapping is a method used to prevent driver pins from falling into the plug. Top gapping tapers driver pins.